Pride of place on the list, that’s what Canva gets. Finally the lovely people behind my design tool of choice online have added an iPhone app to their repertoire and it’s made making blog graphics and images for social media much easier on the go. It’s not perfect, some of the design options from the website have not yet been added to the app (Blog Title, I’m looking at you), however it’s definitely an asset in my blogging arsenal and I’d recommend it to anyone. The basic version is free, but as with the online version, there is the option for Canva for Work which is a subscription service, if you’re a heavier user and want to make things a bit more streamlined with your images with minimal effort. The iPhone app for the most part has been less cumbersome to use than the iPad one was at the start, which is always a good sign. Love love love this app. This one is a recent discovery for me, but it’s made my photo editing come on a lot. It’s free and simple to get used to, but I’ve definitely noticed a difference in my picture quality. As someone who has never really been good with things like Photoshop, it’s been fantastic for something really user friendly for my blog and Instagram. One of the biggest issues with promoting blog posts is engagement at different times of the day. Facebook in particular is a demon for deciding to show only a few people some posts, and highlighting a lesser post to the masses. In order to combat this as much as possible, scheduling posts to hit as many people as possible throughout the day, without having to spend the day online is the answer. My personal favourite tool for this is Buffer, both the online and the app version. I find the app really easy to use on the go and it ensures that my social media channels (Facebook and Twitter in particular) are kept full for sharing and re-sharing older posts, without seeming too robotic since it’s not automated messages, just my own personal touch being scheduled. Really handy for keeping an eye on how certain posts do compared to others too. While I’m not as big a fan of Hootsuite as I am of Buffer, it definitely does support more platforms and it’s not one which I’ve explored fully. However, it’s a heavy hitter where content planning is concerned and the app is really user friendly. Hoot suite allows interaction with posts – replies and likes, whereas Buffer is more so dependent on scheduling individual content. The analytics side of things is much bigger here too – analysing the social networks as a whole instead of just the posts you publish through Hootsuite. If you’re looking for an all out social media manager, this may be the app for you. The basic version is free but there are Enterprise options for heavier users. I’ve just started to use Tailwind for Pinterest lately and have really noticed a difference in ease of use. It was recommended by other bloggers and I can see why – it means all my pinning can be sorted out in one go, without spamming those on my feed. I’m noticing an increase in my traffic from Pinterest already, something I may write about in a little while. This one is a paid service BUT if you’d like a free month’s trial to see if it will work for you, follow this link! Google Adsense is something I didn’t really look into until a few months ago, and while it’s not exactly keeping the lights on in the BadMammy house just yet, it’s definitely funding some of the coffee so I’m a fan. The Adsense App is great for on the go to check how you’re doing and to keep an eye on whether or not the yacht buying dreams will be coming true this month. It could not be simpler. No yacht here this August, but we’ll keep the fingers crossed. Keeping an eye on stats has become a tiny bit of an obsession with blogging, and an essential tool for any blogger is the powerhouse that is Google Analytics. However, if you’re anything like me, the web version can be a tad intimidating and seem overly complicated. The app is a lifesaver as far as that’s concerned – really well laid out and easy to manoeuvre, to ensure you’re up to date with how your blog is doing. Definitely a must-have in any blogger’s app kit. Want a feed of all your favourite blogs in the one place? Want to make your blog easy to access for your readers? Bloglovin is the dude for you. Really easy to sign up and follow different blogs you like, make sure you never miss a post with the feed and discover new blogs at the same time. For your own blog, getting it out there to the masses is simple. Just claim your blog, follow other blogs in your niche and share a widget on your blog – the followers will come in their droves. Maybe. Ahem. One of the basics but an essential tool nonetheless, this app is great for managing your Facebook blog page on the go. Share posts, pictures, links and respond to your loyal followers from your phone with ease. Again, basic but essential. I love twitter for both promoting my blog and for actually getting to take part in conversations with others – 140 characters at a time. It can be very fast paced so is an essential for on your phone when you’re on the go to make sure that you’re all kept up. There are other apps out there for the platform but I actually prefer to use the basic Twitter app on my iPhone. Home of the pretty pictures and the amazing filters. While it’s not the worlds best for blog promotion (lack of ability to link within posts is definitely a bugbear here), it can really help with engagement with your readers if you’re showing your life through a lens. It’s also a great way to connect with other creators, and to get some serious food, clothes and holiday envy. Hide your bank card now. Last but not least, Pinterest – a fantastic source of traffic and inspiration all in the one. I treat Pinterest as a google search for bloggers – it gives me ideas for posts, inspiration for meals, tips on how to do different things. Pinning your posts requires a good image – make sure to use something like Canva – that will catch the eye – and can definitely spread your posts to a much wider audience. I’ve got different pin-boards for different topics as well as one main blog posts pin-board and have found that it definitely sends more people to my blog than would normally get there. (I’d be interested in doing a post on optimising your Pinterest to increase views if anyone was interested in that, sharing what I’ve found works and doesn’t work – let me know in the comments below). The iPhone app is easy to use and great for quick inspiration! 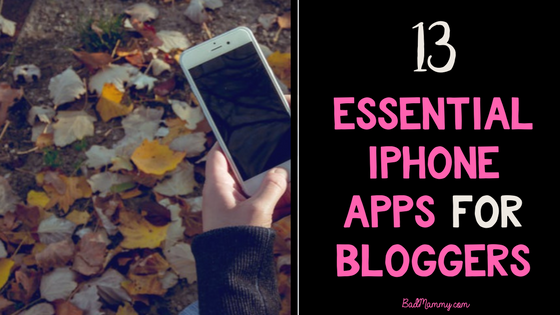 So there we have it, thirteen iPhone apps which will enhance your blogging experience. Hopefully there are some new suggestions in there for you that will help you make it as pretty, efficient and shareable as possible! I’d love to know what apps I’ve left out that you think are ESSENTIALS – this blogging thing is ever evolving and a constant learning journey! Let me know in the comments below what apps on your iPhone you couldn’t blog without! Keep up with all things blogging on the go on Facebook. Well I am all set, nice to know I have something right. Hmm I think I need to get Bloglovin finally! These are all great apps. I always appreciate things that make blogging easier! Great tips! I love the A Color Story app too for photo editing. I love using canva on my Ipad! I find it actually to use it in the app format than on the web. Thanks for compiling this list! I’m a new blogger and it’s really helpful! I didn’t realise there was an analytics app! I need to try Canva! I LOVE using Pinterest on my phone!!! I love Pinterest in general 🙂 but on my phone that’s like one of my top apps!